The larva of lacewing is a predator of a wide range of pests including aphids, moth eggs and small larvae, scales and whiteflies. Adults, 15 mm long with long lace like wings. Eggs, laid on fine stalks. 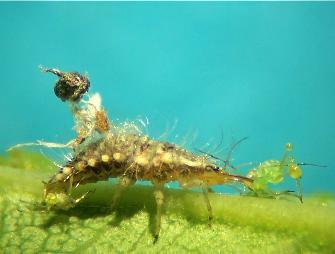 Larvae, pinchers for attacking prey, carry debris on their backs. 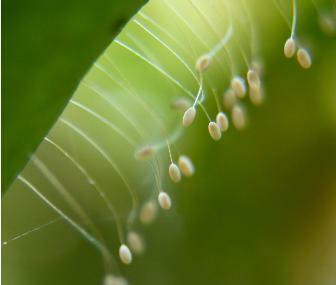 Lacewings are supplied as eggs from which larvae hatch shortly after arrival. Supplied either as loose eggs or with eggs adhered to small strips of paper. 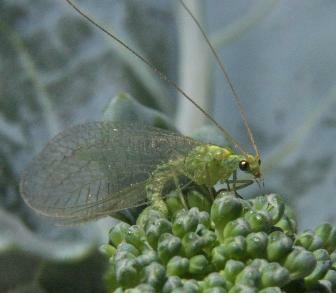 Place the lacewing eggs through infected plants. Protected crops: apply to pest infested areas initially at higher rates of 1,000 eggs per 200 m2. Followed by regular releases of 1,000 eggs per 1,000 m2. Field crops: use inoculatively by applying 1,000 - 4,000 eggs per hectare. Preferably make two applications 10-14 days apart. Or view or download a PDF file of the Book entry for Green Lacewings.